Home › haldecraft › Like to shop local? 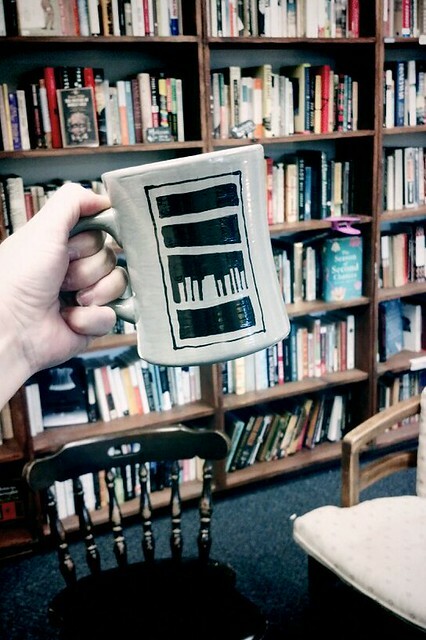 I made some mugs for Broken Shelves Books & Art here in Gainesville Florida (here's their Facebook page). These are ginormous 16-ounce mugs with the Broken Shelves logo on them. Find them locally at Broken Shelves (in the Sun Center behind the Hipp downtown, Gainesville, Florida) or give them a call at (352) 234-6356, Tuesday through Saturday, 5 PM - 11 PM. I bet he'd ship one to you!